How can this be a question, you might ask? Green or Toxic? I don’t want my students/children/children’s friends exposed to toxic products during a car wash fundraiser! I want to share the “how” and the “why” of putting on a Green Car Wash Fund Raiser. I look forward to your comments, at the end of this blog post. 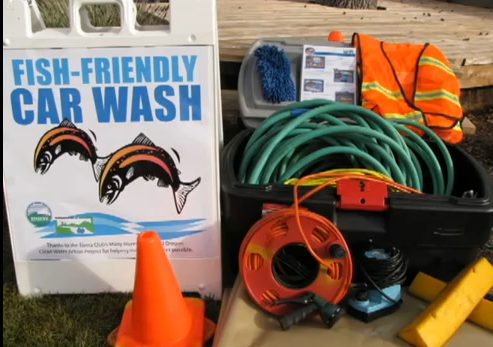 If you are in the Eugene or Springfield, OR area (and many other areas in the country also have these kits) you can borrow a Fish-Friendly Car Wash kit. 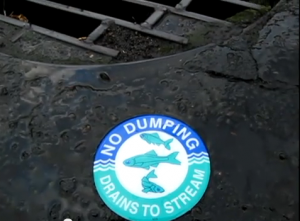 no processing of any kind of the storm water – just straight to the local rivers. During the summer we swim in our rivers, we fish in our rivers, our children and dogs play in the rivers… Doesn’t it sound like a clean river would be a great idea? Did you know that when you wash a car, you are washing off: soap (usually toxic), oil, chemicals and heavy metals? In your neighborhood, where does your storm/street water go? When you or your neighbors wash your car, and the water runs down the street, where does it end up? The answer might surprise you. What are you planning on using as soap? Have you read the label? Do you know what’s in it? This is a great question to ask the car washing team. The answers will surprise you! And not in a good way. When you are scouting out locations, walk around. How is the water drained away from your site? Is there lots/some trash in the location that may be washed down the drains? Cigarette butts, wrappers, lots of oil on the pavement and other trash, etc. Does the location have access to a grass or gravel area where the water could soak into the ground and be naturally filtered? Is there a place where you can run a waste hose (into the sew system), so the water can be filtered? Where to purchase my recommended and favorate multipurpose non-toxic, organic, biodegradable cleaner –click here. Often, using a detergent-based cleaner (conventional products) can break down the wax on the car, stripping the wax away and leaving the paint dull and unprotected. This is not a good marketing tool for your fund raising car wash! Good car wash soaps are not made up of detergents and will be rich in lubricants (why? To help the grime glide off the car). Tempted to use a “cheap” conventional detergent product? Think again. The owner of the car will be unhappy with the results and remember the drains to streams? Do you really want to swim in that detergent? Did you know that a 5/8 inch hose running at 50 pounds per square inch uses 10 gallons of water per minute, compared to washing your car at a self-serve car wash for only 11.1 gallons? The average amount of water used to wash a vehicle, using a low-flow nozzle is approximately 20 gallons. How many cars will you wash during your fund raiser? Some estimates on the amount of water used are between 80 to over 100 gallons, per car! Use a spray nozzle with an automatic shut-off to wet and rinse the cars. Use the 3 bucket method a) the first bucket is for the wheels and rims, b) the second bucket is for clean water and c) the third bucket is for soap. Wring the sponges and washrags into the bucket, not the ground. The Clean Water Act, which turned 40 in October 2012 mandates the protection of all freshwater in the United States. This legislation was needed because of all the pollution in our waterways, the dead fish in our lakes, the fires on our lakes and waterways.